With the increasing popularity of User Experience as an essential part of the design process, many people are trying to learn how to create great User Experience and become UX specialists. Additionally, many organizations try to make it in the education business, and sell knowledge in this area. You should look carefully at the educational offer and choose only those courses that will provide maximum value. It's not only the matter of the time spent and the quality of knowledge, but also the money invested. Digital space is full of short and longer courses and trainings, and, as in any other subject, it is essential to go through them all and identify the really useful ones. As everyone wants to have a piece of the cake, a careful verification and justification will help to pick the right courses. Below, you will find a table with interesting courses for every stage of advancement in User Experience. We’ve considered many areas there: soft skills, interpretation of data, prototyping, and translating all the above into the language of design. Interaction Design Foundation might offer the most complex online course, including all the research and design lessons. A membership also brings users many more additional benefits like an access to exclusive articles and learning sources. User Experience Research and Design by The University of Michigan also offer a wide range of courses for the adepts of UX. All courses finish with assessments, so users could check what they have really learned during the courses. A great option in terms of complexity and quality of courses is an online course on LinkedIn, Practical UX Weekly. During a a few courses, users can learn comprehensive and practical approaches to UX processes. Whenever you want to Master the Research Process, courses provided by Design Lab will be a great option. The 4 Mentor Sessions and building a UX portfolio are definitely the highlights of this course. The course provided by UX Training is based on the learning-by-doing approach. During the course, you'll complete several practice projects designed to build your skills, confidence, and experience in core UX techniques. 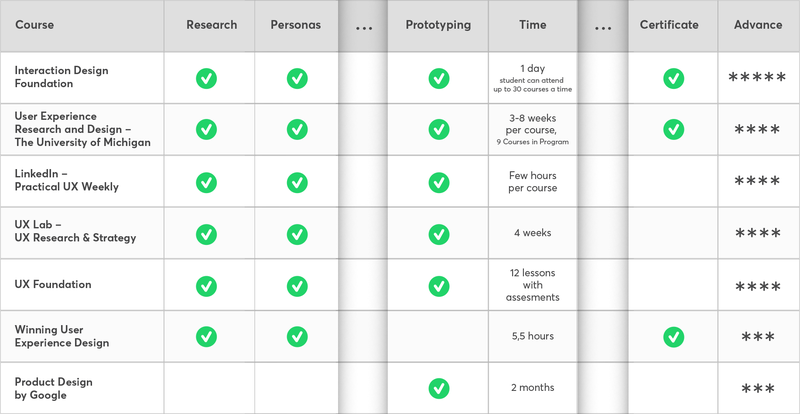 A really interesting position on the map of UX courses. The User Experience Design: Create Addictive Websites course presents itself as a remedy for improving customer satisfaction, enhancing the search ranking and converting more traffic into sales. The time vs money ratio looks especially interesting in this course. Last but not least, a really interesting position provided by… Google! The Product Design Course is designed with the aim of helping you make your game-changing idea a reality and transform it into a business. The course blends theory and practice to teach you product validation, UI/UX practices, Google’s Design Sprint, and the process of setting and tracking actionable metrics. The key criteria for this review were: a practical approach, real-life exercises, and assessment policies. You need to be aware that there are no shortcuts, and you will not improve your skills overnight. The reason for this is that we have two types of knowledge. The first type of knowledge is formal (or explicit) knowledge. You can get it on your own from books, movies, the Internet, and guides. you will have had a fair share of it . Formal knowledge can be expressed by means of words, numbers, signs, symbols, and images. Thanks to this, it is easy to duplicate, which is very practical, but negatively affects its market value. The other type of knowledge is tacit knowledge.You cannot obtain it from books, films, or the Internet – hence the name. Tacit knowledge cannot be expressed with words – it is practical experience, intuition, and know-how. Due to its subjective nature and ”resistance” to being codified, Tacit knowledge can be propagated only during live interaction with a human being. So after learning everything from the following courses, I encourage you to try to implement all that you’ve learned, preferably under the supervision of an experienced mentor. I hope you’ve found this article useful and you will enjoy learning more about UX! Feel free to leave a comment below if you want to get in touch.